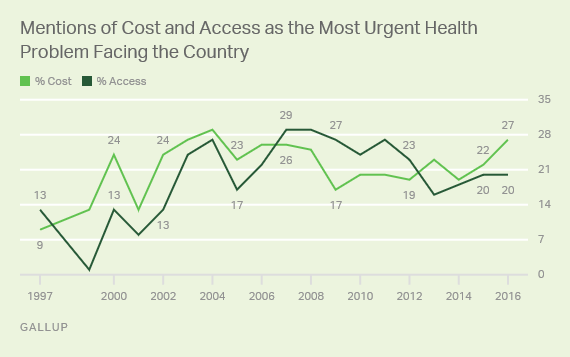 PRINCETON, N.J. -- More Americans now mention healthcare costs (27%) than mention access (20%) when asked to name the most urgent health problem facing the U.S. These two issues typically rank at the top of the list in Gallup's annual poll but have tied for first the past two years. The Affordable Care Act was designed to address the problems of cost and access in the U.S. healthcare system. 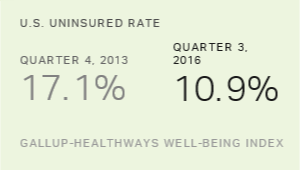 Since the law was implemented, the percentage of uninsured Americans has declined significantly. At the same time, many who have bought plans through federal and state health insurance exchanges are facing steep increases in what they will have to pay for those plans. Attention to those price increases from the news media and politicians this year may be one reason cost has edged ahead of access this year in Americans' identification of the most urgent health problem. These results are from Gallup's Nov. 9-13 Health and Healthcare poll, conducted before the government released a report showing healthcare spending increased rapidly in 2015 and totaled $3.2 trillion in the U.S. The last time that cost or access did not finish first as the most urgent health problem was in 2001. That year, bioterrorism edged cost and access amid a nationwide scare involving the mailing of letters containing anthrax spores to government and news media officials, resulting in five deaths. Further back, AIDS was named the most urgent health problem in the 1980s and 1990s, including in 1987 when a record-high 68% mentioned it. After cost and access, Americans today identify several other health conditions as the most urgent health problem, including cancer, obesity, diabetes, drug and alcohol abuse, and mental illness. Likely because of major advances in the treatment and prevention of the condition, AIDS now barely generates any mentions, with less than 1% naming it in 2016. In addition to the increase in the percentage mentioning cost this year, another notable change is the drop in the percentage naming obesity as the most urgent health problem, from 15% to 8%. That is the lowest percentage mentioning obesity since 8% also named it in 2009. The decline in concern about obesity is not because obesity rates in the real world have improved; rather, it may reflect less public and media attention paid to the issue than in prior years. The increased salience of cost as an urgent health problem this year is primarily driven by college graduates. Mentions of the issue are up 11 percentage points among college graduates, while other education groups' figures are similar to last year. 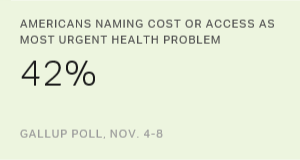 Currently, 37% of college graduates name cost as the most urgent health problem. That compares with 27% of those with some college and 19% of those with a high school education or less. College graduates may be more aware than those with less education of the news reports about the significant increases in the cost of exchange-based plans. Older Americans are typically more likely than younger Americans to say cost is the most urgent health problem. This year, 32% of those aged 50 and older name cost, compared with 24% of 30- to 49-year-olds and 18% of 18- to 29-year-olds. Republicans, independents and Democrats do not differ meaningfully in their perceptions that cost is the most urgent health problem facing the country. During his presidential campaign, Donald Trump promised to repeal the Affordable Care Act. With a Republican president and a Republican majority in Congress, the odds of a successful repeal are greater. The law has been controversial since its passage, and while it has helped to significantly reduce the percentage of Americans who lack health insurance, it is unclear whether it has helped to rein in healthcare costs. The recent government report on healthcare spending casts doubt on whether the law has achieved that objective. Costs are now uppermost in Americans' minds when they are asked to name the most urgent health problem in the U.S., and that was the case even before the government report came out. Irrespective of whether Trump and the Republicans are ultimately successful in repealing the Affordable Care Act and possibly putting new legislation in place, it appears likely that healthcare costs will remain a major political issue throughout the next four years.